Looking for a Giant South African Leopard Tortoise for sale? We’ve got the nicest giant leopard tortoises for sale anywhere! We have some beautiful, active and healthy captive bred REAL baby giant south african leopard tortoise for sale (Aprox 2-2.25″). We do recommend the 6 month old well started giant leopard tortoise babies (available here) over the fragile fresh hatchlings for those with less experience as they’re even more active and easier to care for then the hatchling stage. (Pardalis Pardalis) The South African Giant Leopard Tortoise, Pardalis pardalis is a rarely seen, very large growing sub species of the common Leopard Tortoise (pardalis babcocki) from the extreme southern portion of the Leopard Tortoise range into Namibia and South Africa. The“giant”of the Leopard Tortoises, reaching lengths of 14-22 inches on average at 40-65lbs, Giant South African Leopard Tortoises are easily distinguished by their tell tale spotting in the center of their shell, having “double or triple dots” rather than single or no dots like a standard leopard tortoise (pardalis babcocki). Be very careful when choosing your giant south african leopard tortoise for sale, as MOST sites on the internet are selling REGULAR pardalis babcocki leopard tortoises and saying they are giants. The giants are not only bigger, they are known for being are a bit more outgoing and personable than a normal leopard and also have a marbled spotted pattern on their head and body, setting them apart from the traditional sub species. They do well on Mazuri tortoise chow, opuntia cactus and a variety of mixed greens and grasses with a dusting of calcium supplement all available at Tortoise Town. We pride ourselves on selling only top notch tortoises, ready to ship to you via FedEx Overnight in heated insulated boxes. One shipping charge covers up to 3 tortoises. Purchased a pair of giant South African Loepard Torotises about a week ago. They shipped the very next day overnight and arrived safely. The tortoises are both doing excellent and couldn’t be better quality animals. Super happy with my purchase. . I bought a baby Giant South African leopard tortoise from tortoise town about 2 months ago and wanted to give feedback. I’m so happy I found tortoise town! They were so very helpful with everything and responded to my many questions very quickly. Most importantly my new leopard tortoise baby is doing fantastic and I just ordered a 6 month old to go along with her! 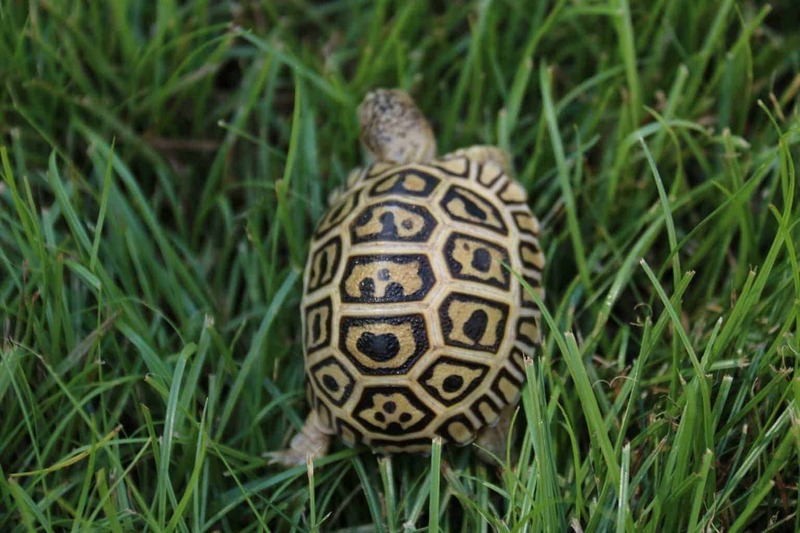 Thank you for the nicest pardalis pardalis leopard tortoises for sale around! Recently bought 4 of these giant South African leopard tortoise. They are amazingly cute and doing well. Rob and their team did and amazing job. Both transactions were smooth and no hic*cups. Overall, I’m very happy and satisfied with my purchases. I highly recommend Tortoise Town for anyone looking for a tortoise for sale.